Were Hedge Funds Right About Flocking Into Micron Technology, Inc. (MU)? Before we spend countless hours researching a company, we’d like to analyze what insiders, hedge funds and billionaire investors think of the stock first. We would like to do so because our research has shown that the elite investors’ consensus returns have been exceptional. In the following paragraphs, we find out what the billionaire investors and hedge funds think of Micron Technology, Inc. (NASDAQ:MU). Micron Technology, Inc. (NASDAQ:MU) shareholders have witnessed an increase in hedge fund sentiment in recent months. 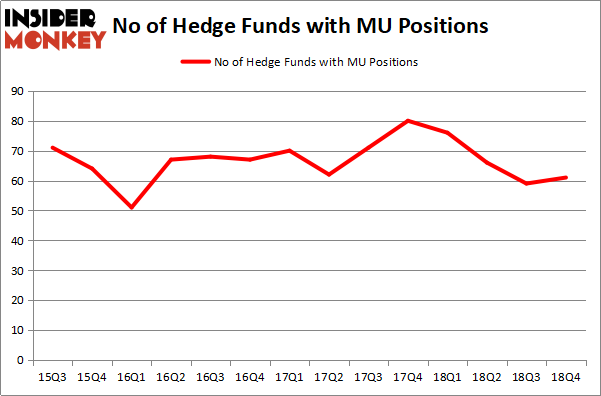 Our calculations also showed that MU isn’t among the 30 most popular stocks among hedge funds. Let’s check out the fresh hedge fund action surrounding Micron Technology, Inc. (NASDAQ:MU). How have hedgies been trading Micron Technology, Inc. (NASDAQ:MU)? Heading into the first quarter of 2019, a total of 61 of the hedge funds tracked by Insider Monkey were bullish on this stock, a change of 3% from the second quarter of 2018. The graph below displays the number of hedge funds with bullish position in MU over the last 14 quarters. So, let’s review which hedge funds were among the top holders of the stock and which hedge funds were making big moves. When looking at the institutional investors followed by Insider Monkey, AQR Capital Management, managed by Cliff Asness, holds the most valuable position in Micron Technology, Inc. (NASDAQ:MU). AQR Capital Management has a $725.1 million position in the stock, comprising 0.8% of its 13F portfolio. 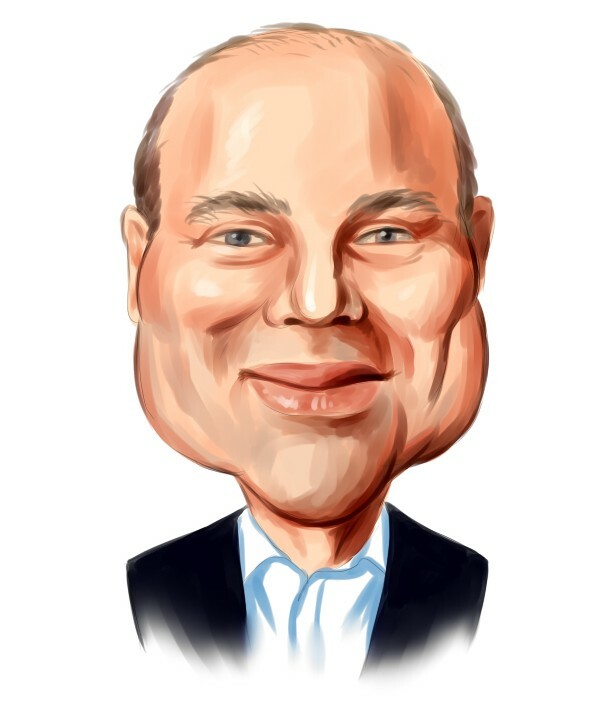 Coming in second is Appaloosa Management LP, managed by David Tepper, which holds a $507.7 million position; 25.1% of its 13F portfolio is allocated to the stock. Some other hedge funds and institutional investors that hold long positions consist of Ken Griffin’s Citadel Investment Group, D. E. Shaw’s D E Shaw and Alex Snow’s Lansdowne Partners. Consequently, key money managers have jumped into Micron Technology, Inc. (NASDAQ:MU) headfirst. Lansdowne Partners, managed by Alex Snow, established the most valuable position in Micron Technology, Inc. (NASDAQ:MU). Lansdowne Partners had $234.9 million invested in the company at the end of the quarter. Peter Rathjens, Bruce Clarke and John Campbell’s Arrowstreet Capital also initiated a $210.4 million position during the quarter. The following funds were also among the new MU investors: Jim Simons’s Renaissance Technologies, Patrick Degorce’s Theleme Partners, and Herb Wagner’s FinePoint Capital. Let’s now review hedge fund activity in other stocks – not necessarily in the same industry as Micron Technology, Inc. (NASDAQ:MU) but similarly valued. We will take a look at Activision Blizzard, Inc. (NASDAQ:ATVI), BCE Inc. (NYSE:BCE), Public Storage (NYSE:PSA), and Banco Bilbao Vizcaya Argentaria SA (NYSE:BBVA). All of these stocks’ market caps are closest to MU’s market cap. As you can see these stocks had an average of 24.25 hedge funds with bullish positions and the average amount invested in these stocks was $952 million. That figure was $3026 million in MU’s case. Activision Blizzard, Inc. (NASDAQ:ATVI) is the most popular stock in this table. On the other hand Banco Bilbao Vizcaya Argentaria SA (NYSE:BBVA) is the least popular one with only 4 bullish hedge fund positions. Compared to these stocks Micron Technology, Inc. (NASDAQ:MU) is more popular among hedge funds. Clearly hedge funds like Micron a lot and they were rewarded for their bullishness in 2019. Our calculations showed that top 15 most popular stocks among hedge funds returned 19.7% through March 15th and outperformed the S&P 500 ETF (SPY) by 6.6 percentage points. Hedge funds were also right about betting on Micron as the stock returned 24.6% and outperformed the market as well. Is Vertex Pharmaceuticals Incorporated (VRTX) A Good Stock To Buy? Were Hedge Funds Right About Dumping FedEx Corporation (FDX)? Were Hedge Funds Right About Ecolab Inc. (ECL)? Were Hedge Funds Right About Selling Northrop Grumman Corporation (NOC)? Is Illinois Tool Works Inc. (ITW) A Good Stock To Buy? Were Hedge Funds Right About Getting Into Bank of Montreal (BMO)?